To make the most of my time in this beautiful country the girls and me decided to go on a weekend day trip. We left the house at 7am and took a minibus to Dambulla, driving through rural Sri Lanka, with a few spots of rain along the way. 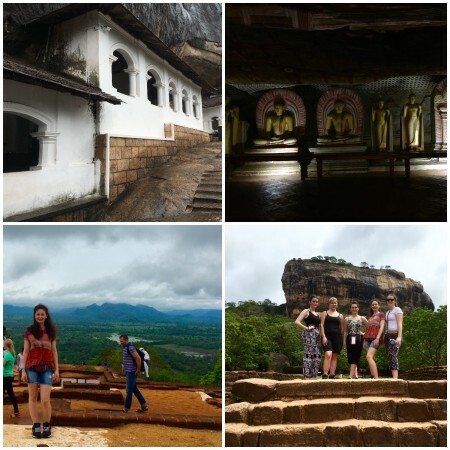 We arrived in Dambulla an walked up a small hill and at the top there were small temples hidden inside the rocks. From there we drove to Sigiriya, also known as Lion’s Rock, the 8th wonder of the world. We climbed the numerous steps right to the top, although the weather was still cloudy the view was beautiful. On the way back we stopped at a street-side fruit stall to get some fresh mango, which is currently in prime season, it was so delicious and fresh. I am in mango heaven!! Due to the rain we were unable to go on a wild animal safari but I did manage to see some wild peacocks when we were driving. 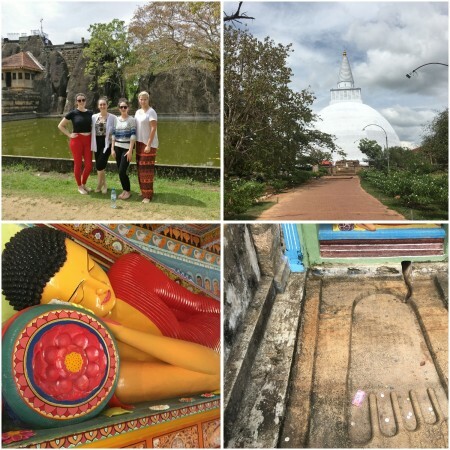 Today we went to visit some of the sacred city in Anuradhapura, visiting temples, stoopas and religious monuments. It was very interesting to learn a little bit more about Buddhism and the stories and beliefs held. I learnt that the reason we have to take our shoes off to go into the temples or places of worship is meant to be so that you are closer to the earth. I learnt about moon stones and about the principles of your spirit living on through someone or something else. Our tuktuk driver was so lovely driving us to the different sacred places and walking around the places with us, even with little english we managed to communicate well. As a nation Sri Lankan’s show such respect to visitors especially if you work in the hospital. The weekend has given me chance to explore a bit more of North Sri Lanka and gain a greater appreciation of Buddhism and its cultural meanings and traditions. Even with some rain along the way! I know also have a slight obsession with taking pictures of monkeys!